Mods that don't fit in any other category. A long time ago I used to use a mod by Zerbu that allowed players to change the career outfit that gets assigned by the game when you join a job. I used it mostly to give glasses back to my spectacled Sims while at work but I could also change other parts of their outfit if I liked. Sadly, Zerbu's mod stopped working a long time ago and he's never gone back to update it so here we are today with my attempt to recreate that mod. This mod REQUIRES Scumbumbo's XML Injector in order to function. Make sure you go download that as well or this mod won't work. 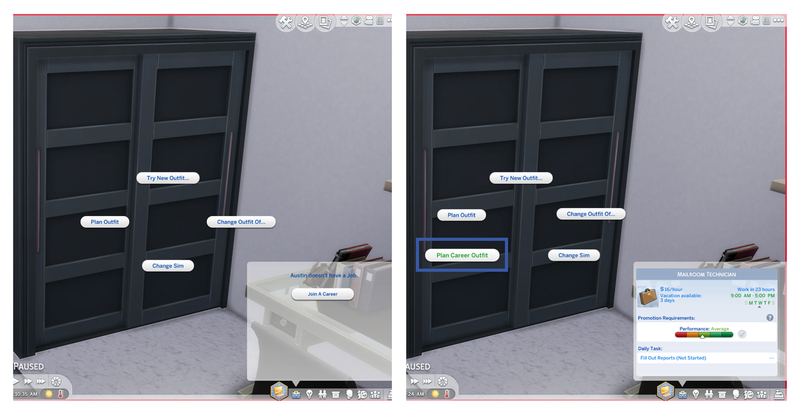 This mod will add a new Plan Career Outfit interaction to all mirrors, dressers, and Get Together closets. 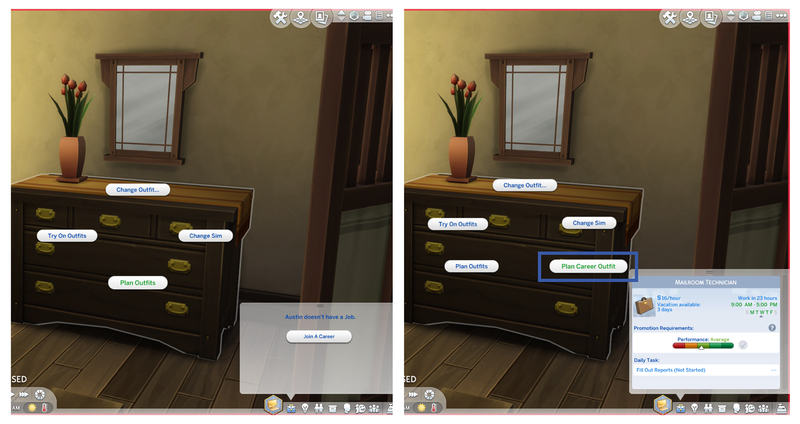 It will also be added to any other object that already has the Change Sim interaction so this means it will automatically work for Custom Content creations as well. Hurrah! 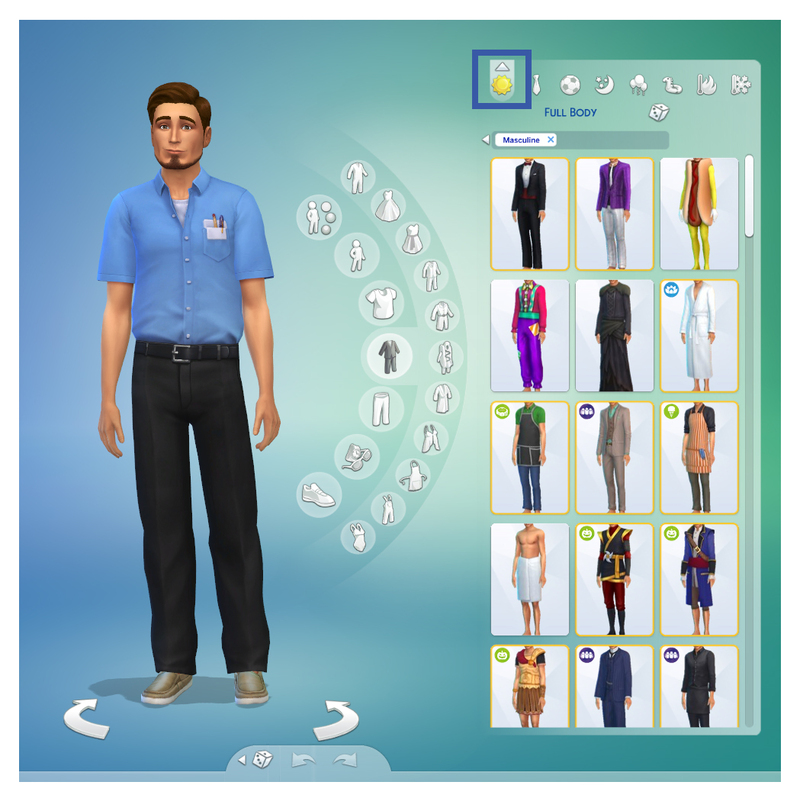 The interaction is only available to Sims who are currently employed and aged Teen and above. 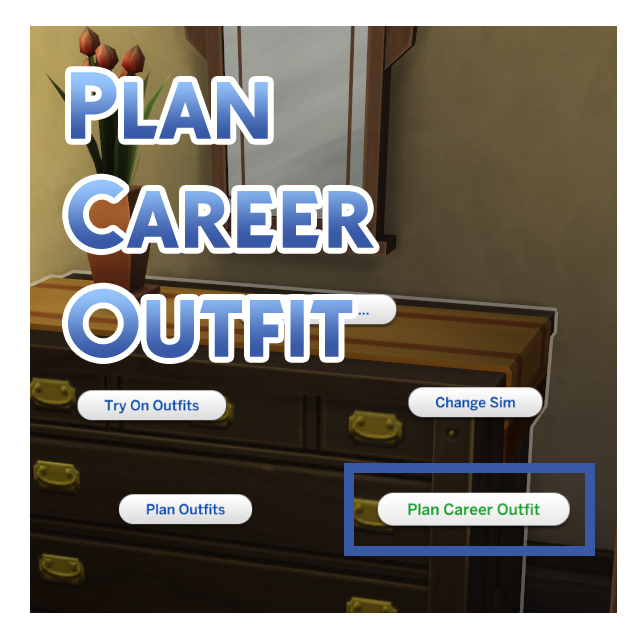 When you select Plan Career Outfit your Sim will walk to the clicked on object and be taken into CAS where they will appear in their current career outfit. There won't be a special Career category and instead the Everyday tab will be selected. Make sure not to change the clothing category or the changes will be applied to the Everyday outfit instead. When happy with your changes, exit CAS as you normally would by clicking on the tick icon. The next time your Sim leaves for work they will now be wearing your new chosen outfit. 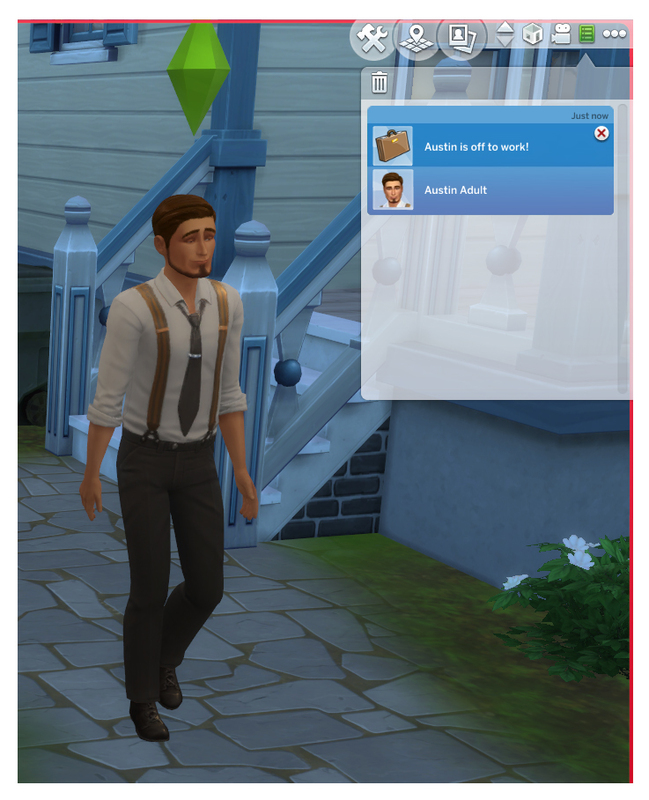 Many thanks to Andrew over at the Sims 4 Studio forums for helping me to get the employment check working. You will REQUIRE Scumbumbo's XML Injector for this mod to function. Ensure you have script mods enabled. This mod should not conflict with anything thanks to Scumbumbo's XML Injector. No in-game tuning is overridden. I have attempted to translate the interaction into all languages supported by the game with the use of Google Translate. If the translations are wrong, please provide the correct translation and what language it is for and I will gladly update the package. You will require Scumbumbo's XML Injector to use this mod. Download the XmlInjector_v2.zip from the linked post and place the XmlInjector_Script_v2.ts4script file in your Mods folder no more than one folder deep. 2. Extract: Use WinRAR (Windows) to extract the .package file(s) (if included, ts4script as well) from the .rar or .zip file(s). 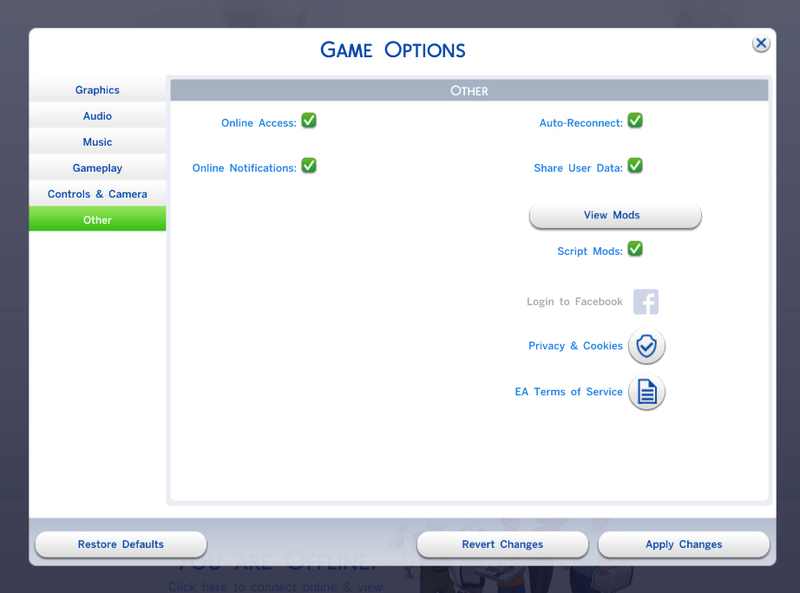 No Mosaic / Censor Mod for The Sims 4 - Toddler Compatibility Update!